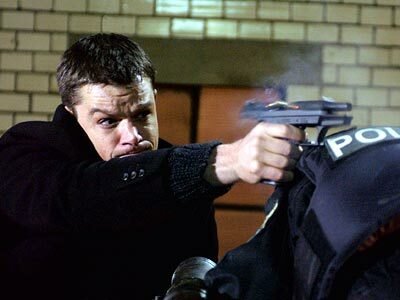 Resurrecting the raw, urgent realism of Doug Liman’s original anti-thriller, Brit director Paul Greengrass puts Matt Damon’s amnesiac assassin back in the crosshairs. Only this time, framed for murder by the CIA, it’s Bourne’s turn to play the hunter. Hired for the visceral kick of Bloody Sunday, Greengrass proves a perfect fit, the shivery immediacy of his docu-verité camerawork giving the action fantastic edge. He takes it too far (the paper-shredder editing is a headache on prescription) but when it works, it really works: whiplash fight sequences rattle teeth in their sockets and the movie hurtles to its conclusion through a devastating crash’n’smash car chase. In the midst of it all is another angsty, spring-coiled turn from Damon, especially impressive given the script offers him little beyond paranoid memory judders. Indeed, missing the first film’s who-am-I? motor, Supremacy just doesn’t have the depth or direction in its narrative hyper-jumble, rarely pausing long enough to soak up its characters’ choked emotions. Even with the immense Brian Cox holding Joan Allen’s unconvincing agency investigator in focus, anyone who didn’t catch Bourne Identity will struggle to stay on track. Bourne needs to start filling in the blanks, because this stylish, kinetic franchise is fast burning up places to run. Were you keen to do the sequel? In studios, everybody has an opinion on a scene. We had four writers in the end, you see. I thought, “This is going to be the best DVD ever – there was so much wonderful material. But I don’t think they’ve had the courage t include it, which I think is a shame because there’s a real process in filmmaking – the honest part.